KBS Shafts advanced steel shaft technology, utilized in leading club manufacturer’s irons,accepted in every manufacturer’s custom department and adopted by over 150 professionals. 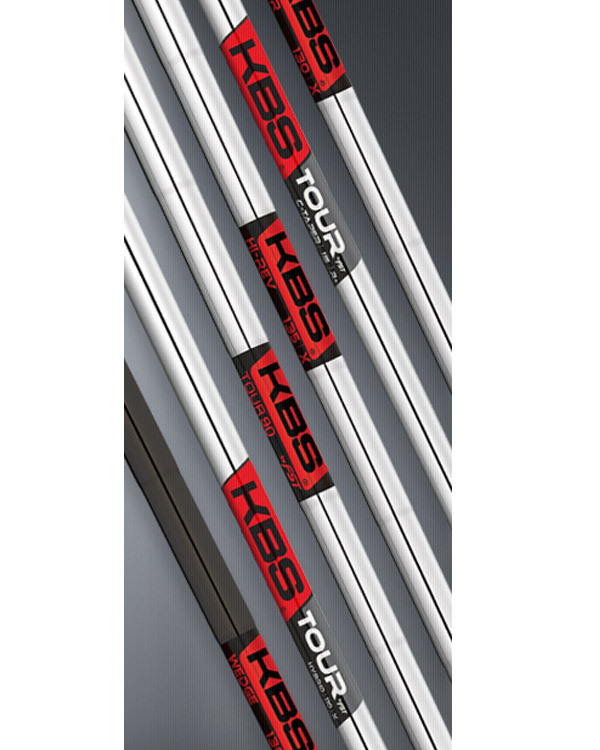 Created by renowned shaft designer Kim Braly and forged from Tour player feedback, the KBS Tour Series features advanced steel shaft technology. Since its inception in 2008, KBS has set a new standard in steel shafts with its unprecedented growth and acclaim. KBS shafts are utilized in leading club manufacturer’s irons, accepted in every manufacturer’s custom department and adopted by over 150 professionals. Tour 90 R 2.5 95 As the lightest shaft in the KBS product line, the KBS TOUR 90 is designed for players seeking higher trajectory, additional spin and maximum distance. Tour R 2.1 120 The KBS TOUR is Kim Braly’s signature shaft and is ideal for players desiring shot versatility and mid trajectory. C-Taper R 125 Inspired by Tour player feedback, the KBS C-TAPER shaft produces a lower flight and spin rate while maintaining the benefits of a piercing trajectory and smooth feel.